DUE TO BACK ORDER OF THIS ITEM IT WILL ONLY BE SHIPPED IN 2 WEEKS AFTER PURCHASE. 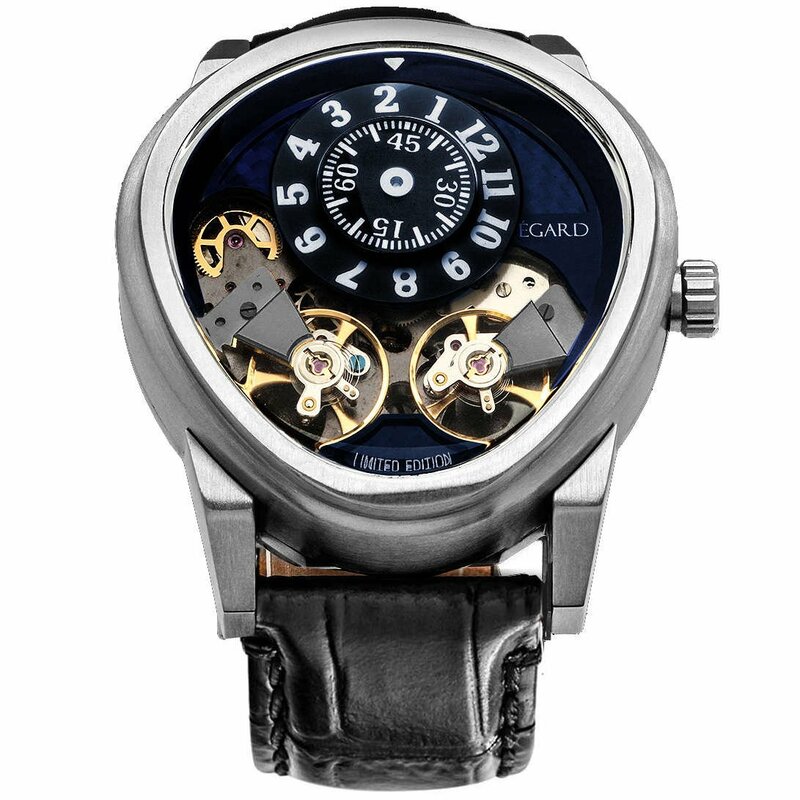 The Quantus is recognized immediately by it's unique case, dual balance wheel movement and uniquely engraved caseback. This limited edition masterpiece has features on it that are rarely seen on any timepiece. Each variation of the Quantus is limited edition and meant to recognize unique method of timekeeping throughout history. The V2-Mayan edition explores the Maya people and their Tzolk'in calendar. The Tzolk'in is the official name for the Mayan religious calendar that consisted of 260 days; the days each had a name and a number from one to thirteen. It was primarily used for religious practices, predictions, and even infant naming. When a Mayan infant was born, he or she would be given the name that corresponded with their date of birth. The Tzolk'in is represented by three interlocking dials that correlate with the year, month and day. Modern Mayans still use this system today to mark special events such as weddings, religious ceremonies, holidays and coronations. 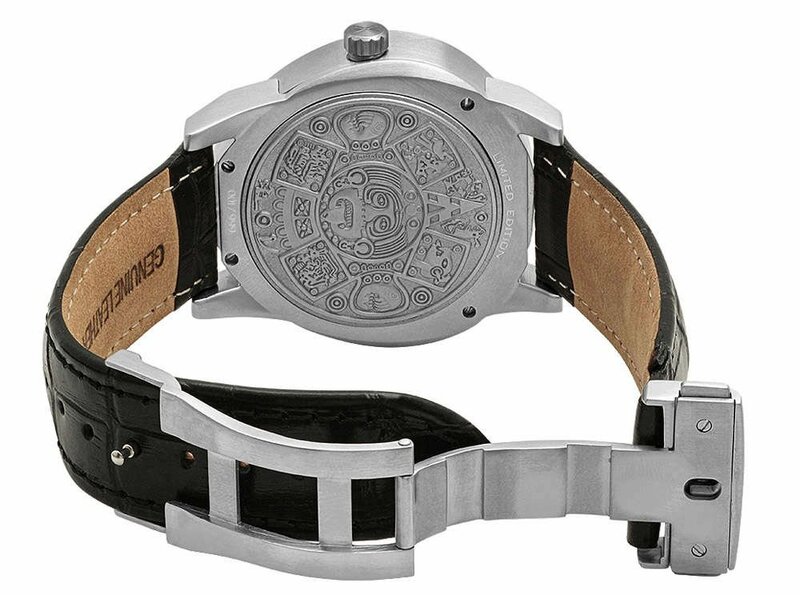 The Quantus V2-Mayan edition features a uniquely intricate engraving of the Tzolk'in calendar as well as limited edition numbering to mark your timepiece as your own. The level of detail on the caseback is one rarely seen on a timepiece and offers an artistic element hidden until the watch is removed from one's wrist to display. 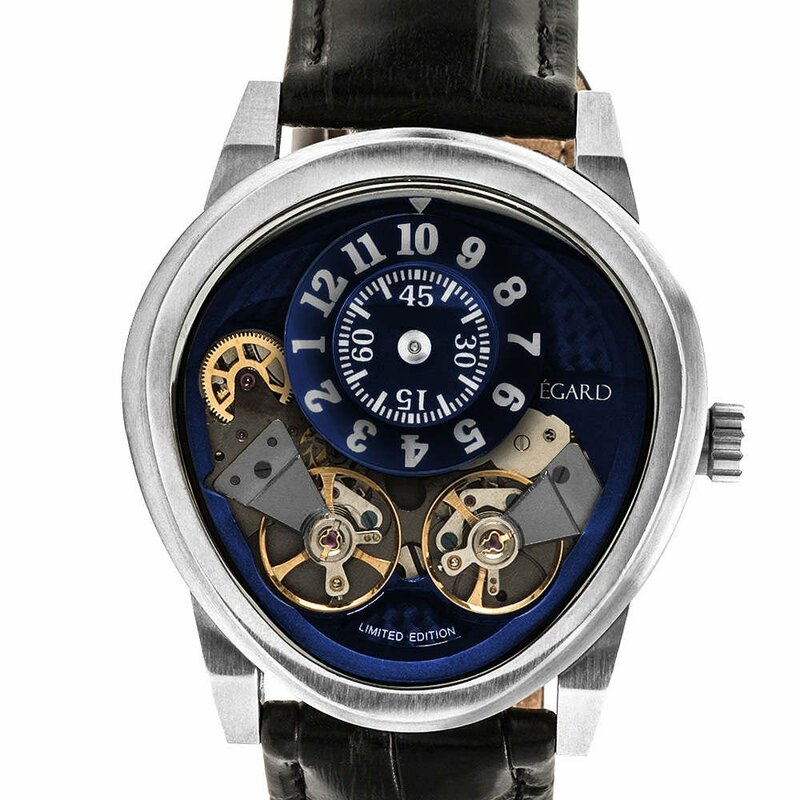 The oblong case and crystal found on the Quantus is a trademarked specialty of the Égard brand. The sapphire crystal placed in the Quantus is one of the most difficult crystal shapes to cut. The oblong nature of the crystal must fit perfectly in the case which is a challenge in itself. Our team spent over a year perfecting the technique of cutting the crystal perfectly. The crystal is curved on top and bottom. It has a curvature throughout the entire crystal as well to wrap the case. The Quantus V2 is the first time we upgraded our case by separating it into two pieces. This allows it to be significantly sturdier and have much cleaner and stronger coating. The curvature of the case allows the 43mm case to wrap perfectly to any wrist. My initial response to Gillette's recent “We Believe” advertisement was positive (despite some of the contrived scenarios in the storyline). So positive, in fact, that when it was immediately framed by the blogosphere to be a litigation against “toxic masculinity”, I stood by the company. I awaited some sort of statement from Gillette to rebut that misinterpretation. I expected them to say something to the effect of, "on the contrary it was actually about men stepping up to do amazing things like making peace between two young men about to fight or spending time in the morning to build up a young daughter’s sense of self worth" (both viral real-life scenarios that were included in their ad). Unfortunately, I was the one misinterpreting Gillette’s message. Instead, the razor company capitalized on the publicity brought about by those who would stand upon the ad to wholesale demonize our fathers, brothers, sons. I felt in that moment the same as I have numerous times in the past few years—that those most ignorant of what makes a man tick were speaking as an authority on it. Two days later, Égard Watch Company uploaded a video response to Gillette “What is a Man?”, one that I watched with tears because it incontestably celebrated the truth of what it means to be a man. It was the same masculinity that I have witnessed in my guy friends time and time again. It was the same masculinity that I have aspired to exhibit as often and as richly as possible. There is a no mistaking it when you see it—it is grace with power; it is faithfulness during weakness; it is courage amidst fear. It isn’t always pretty, but it is pure. 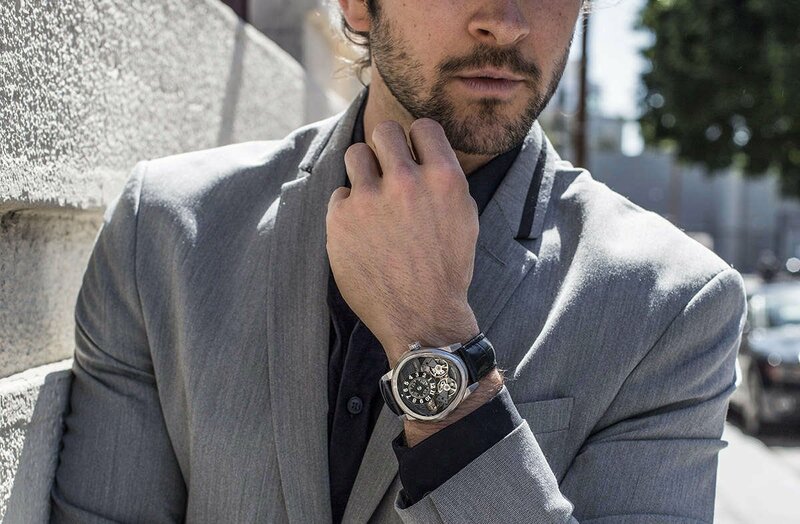 The message behind Egard’s response was heard loud and clear—and it didn’t miss me that a company that sells timepieces for men knows exactly what makes them tick. When my fiancée gave me this mesmerizing, single-run limited edition Egard Quantus Mayan for my birthday, I once again realized how incredibly blessed I am to be engaged to a woman who knows what makes me tick as well. This watch looks and feels very elegant for it's price point. The unique shape of the case and crystal is sure to grab attention. I like this piece very much and look forward to seeing what else is available from Égard in the future.